Tropical Storm Emily weakened to a tropical depression Monday afternoon as it slogged eastward across the Florida peninsula, spreading drenching rains, causing power outages and leaving two fishermen to be rescued from Tampa Bay. The National Hurricane Center said Emily made landfall late Monday on Florida's Gulf Coast south of Tampa Bay and then began moving east toward the Atlantic coast. 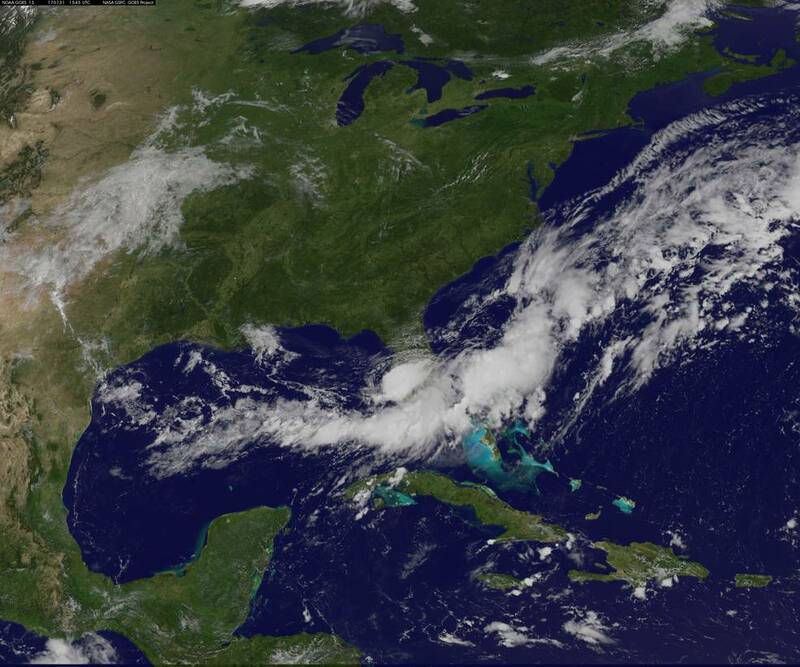 Emily spent only a few hours as a tropical storm, losing strength as it marched inland across the central Florida peninsula toward the Atlantic coast. Florida Gov. Rick Scott said at an afternoon news briefing in the state capital of Tallahassee that about 18,000 homes and businesses lost power, mostly in hard-hit Manatee County. Scott, who was on vacation in Maine and returned to the state when the advisory changed, said the storm was a reminder that severe weather can strike the state at any time. State emergency management officials also said that the Sunshine Skyway Bridge over Tampa Bay, which was closed for a few hours yesterday because of high winds, had since reopened. The storm had maximum sustained winds of 45 mph (75 kph) as it crawled ashore but was down to top winds of 35 mph (55 kph) hours later. No injuries have been reported along the Gulf Coast, although two fishermen were rescued from Tampa Bay while clinging to a channel marker light after their boat sank. Coast Guard officials said they were called Monday morning about the two brothers, who had been out fishing when their boat engine died. Forecasters said Emily was expected to dump between 2 to 4 inches (50 to 100 millimeters) of rain in some areas, with isolated amounts up to 8 inches (200 millimeters) possible in spots. Lesser amounts were predicted elsewhere. On Treasure Island, a barrier island in the Gulf of Mexico west of St. Petersburg, a normally packed beach parking lot was almost empty of tourists Monday. Only a handful of people were on the white sand beach and a few bodysurfed small waves in an area that doesn't normally get waves. Some took selfies amid a mix of clouds and patches of blue sky on the northern fringe of the storm system. Kevin Baker, a 53-year-old retiree who takes his walks daily at Treasure Island, said he decided to venture out despite the storm "to watch the clouds to go by." "This morning was pretty bad. A flood watch is in effect for much of the Tampa area, raising the threat of some scattered street flooding in low-lying areas. Law enforcement agencies urged motorists to drive with caution on a day that began as a miserable Monday morning commute for many. A few Tampa area communities, such as Pinellas Park and Tarpon Springs, offered residents sandbags to stave off any flooding. Earlier Monday, Scott declared a state of emergency for 31 of the state's 67 counties as a precaution. He also headed to the state's Emergency Operations Center for a briefing on the storm and issued a news release urging those in the path of the storm to be vigilant. Forecasters also warned of possible isolated tornadoes and offshore waterspouts spinning off of the system, which sent swirling rain bands across parts of south Florida. A tropical storm warning from Anclote River to Bonita Beach on the Gulf Coast was lifted once the storm headed inland Monday.